Dura-Line pegboards, drying racks, drying trays are constructed of corrosion-resistant 20 gauge type 304 (SS) stainless steel and polished to a #4 finish. 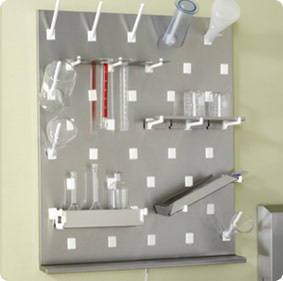 The “V” style pegboard comes in 14 standard sizes with a variety of mounting options. All trays and pegs are easy to clean and are autoclave safe. Dura-Line pegboards are designed with an integral drip trough or catch drain that directs all drainage and run-off into the SS trough. Drying racks are provided with a standard wall mounting bracket, removable snap-in 6” long x 1/2" diameter, white polypropylene pegs and 3 ft. of clear plastic drain tubing. Custom sizes also available upon request with minimum order quantities required. A. Drying rack / drying trays / pegboard bodies shall be of one piece design and of not less than 20 gauge (1.0 mm thick) Type 304 stainless steel with a No. 4 finish. The top shall have two 90-degree ends, and sides to have one 90 degree bend. B. Each rack shall have an integral full width 20 gauge (1.0 mm thick) Type 304 stainless steel drip trough with clear plastic drain tubing. Drip trough shall be continuously welded. C. The trough shall have an optional full length, Type 304 stainless steel wire mesh screen insert. Screen insert shall be turned down on all four sides to provide a clean and finished appearance. D. Pegs shall fit into the punched holes in the rack front. A "T" shaped protrusion on the base of the pegs shall allow easy removal and replacement without the need for tools. The T-shaped holes shall be designed to fit the protrusion on support pegs for holding single or multiple utensil drip trays, drain shelves, funnel racks or pipette holders. Pegs shall be of injection molded white polypropylene. E. Wall hangers will be provided for each rack, designed to enable the removal and replacement of the entire rack for cleaning without the need for tools. F. Stainless steel fixing screws of appropriate type for attachment to support structure will be provided by installer. G. Clear, tight fitting hose to drain from drip trough drain tube into sink will be provided. H. Finished stainless steel back panel will be provided upon request when any portion of the back of drying rack is exposed.